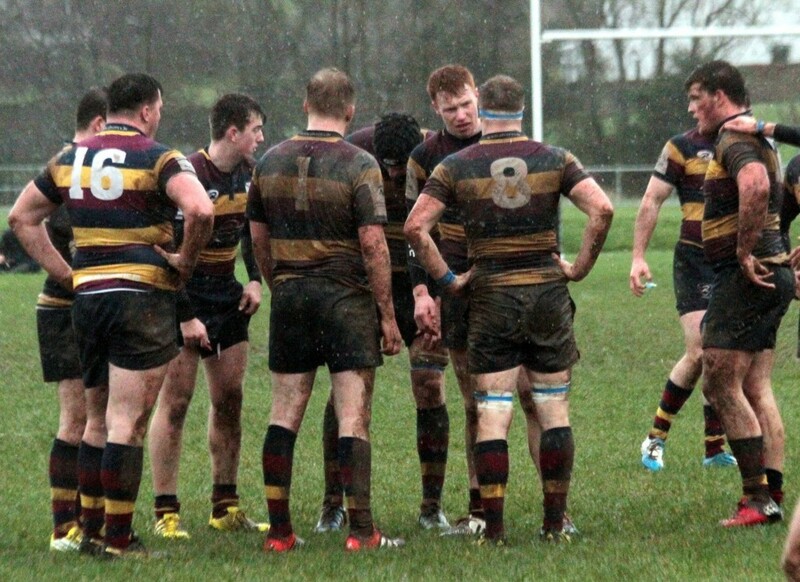 Skerries 1st XV squad gave a truly heartening display, full of commitment and ‘never say die’ spirit, going down to Division 2A league leaders Banbridge in a very wet and blustery Rifle Park on Saturday. The weather conditions dictated the play and it was a case of two halves with the team playing into the wind having the better of the exchanges in each half. Unluckily Skerries just failed to get a losing bonus point, which would have been just reward for this battling effort. The relative short journey up the M1 to Banbridge made for good travelling support as always. There were a number of changes in the team with Ciaran Frawley starting at 10 and Maurice McAuley back at number 15. Banbridge were playing into the elements and with only seven minutes into the game they scored the opening try putting 5 points on the score board. Conditions continued to be difficult. On the half an hour mark Banbridge scored a second try in the corner and converted by Shandon Scott giving the home side the lead, 12-3. Banbridge eager to come away with points on Saturday to keep them at the top of the table scored a third try with the last play of the half making the score 19-3 at the interval. From the outset of the second half and Skerries playing into the rain & wind, Skerries played with more intensity and battled their way back into the game. Ross Halligan came on to replace injured AJ Sherlock. Skerries went through a number of phases with their ball retention was excellent in the conditions and with great work up the short side resulted in Skerries first try scored by Eoghan Carron and converted by Ciaran Frawley, narrowing the score to 19-10. Skerries continued to play the rugby but were forced to make further changes with Paul O’Loghlen on for Ross Dempsey and Robbie Jenkinson replacing the injured Ciaran Frawley. Paul O’Loghlen moved to number 10 and tested the Banbridge defence on a number of occasions. A great cross field kick by O’Loughlen to Robbie Jenkinson just held up in the wind which allowed Banbridge defence to regroup and stop a certain try. With 15 minutes to go, Banbridge applied pressure deep into the Skerries 22 but resolute defence held them out. The resulting 5 meter scrum for Skerries was turned into a soft penalty for Banbridge by the referee for Skerries dropping the scrum. Banbridge opted for a scrum the resulting surge were awarded a penalty try under the post by the referee and adding the extra two points extending their lead 26 points to 10. Skerries kept the momentum going and scored a second try by John Condron and excellently converted by Robbie Jenkinson into the wind leaving the final score 26-17. Amazingly the rained stopped and the sun made a brief appearance. Skerries continued to create further opportunities to get that vital losing bonus point but just fell short. With other results going Skerries way, their league position remains the same but with their battling spirt in scrapping for points in this game will hopefully continue for their remaining 4 games. Skerries team 1 to 20…. Cormac Marrey Kieran Leonard Neil Foster Joe Glennon Aj Sherlock Thomas O’Hare Eoin Matthews Ross McAuley(Capt.) Eoghan Carron Ciaran Frawley Derek Keane Ross Dempsey Kevin McGrath Colin Doyle Mauirce McAuley John Condron Evan Sherlock Ross Halligan Robbie Jenkinson Paul O’Loughlen.